A refrigeration compressor is the critical component in the design of a refrigeration circuit. Its primary function is to regulate the flow of refrigerant around the circuit. Cool refrigerant gas is drawn in at low pressure, and subsequently delivered at an increased pressure and temperature. As a result, the heated refrigerant can release its heat via the cooler air flowing inside the condenser, ready to absorb yet more heat as it passes through the evaporator. Reciprocating compressors can be further classified as hermetic, semi-hermetic or open-types, and are frequently deployed where capacity requirements are higher. Rotary compressors, including vane, scroll and screw compressor designs, are suited to high capacity applications, to a maximum of 1200 kW. Centrifugal compressors are utilised where capacities are higher. Here, piston design can be compared to the type found in motor vehicles. 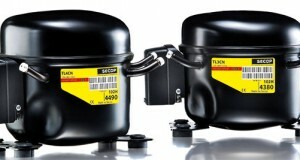 Pistons slide within cylinders, pulling in and compressing refrigerant gases via suction and delivery valves respectively. In open-type designs, one end of the crankshaft is located outside the metal housing containing the pistons. However, in semi-hermetic compressor types, the drive motor and compressor share the same metal housing and they also share one common shaft. The enclosed, semi-hermetic design protects the internal components from contamination. With such semi-hermetic compressors, the housing can be opened to allow inspection and maintenance. Hermetic refrigeration compressors, on the other hand, have a welded housing and are thus completely sealed for the working lifetime of the internal components – as in domestic refrigerators. Orbiting scroll compressors feature two involute scrolls: one stationary, and the other orbiting the first. This motion pressurises the surrounding gas which then discharges through a central hole. Rotary and stationary vane compressor designs have internal cylinder vanes. In stationary types these are an integral part of the cylinder wall, whereas in rotary types the vanes spin on a central cam. In either case, the vanes generate gas movement to achieve suction and compression. Screw compressors comprise two threaded rotors (screws). These are linked together so that the overlapping screw lobes reduce the gas volume, thus causing gas compression. Centrifugal compressors consist of a rotor spinning at high speed within a chamber. Kinetic energy forces gas through a narrow outlet, thus achieving compression. This design is suited to both high, and very high, cooling capacity requirements.